On September 29, 1959, Braniff Airways Flight 542, a Lockheed Model L-188A (Electra) airplane, experienced left wing airborne disintegration near Buffalo, Texas. The flight was scheduled between Houston, TX and New York International Airport, with stops in Dallas, TX, and Washington, DC. 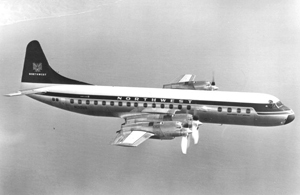 On March 17, 1960, Northwest Airlines Flight 710, a Lockheed Model L-188C (Electra) airplane, experienced right wing airborne failure near Cannelton, IN. The flight was scheduled between Minneapolis, MN and Miami, FL with a stop in Midway Airport, Chicago, IL. The two accidents mirrored each other and shocked the aviation industry. The FAA Administrator requested Lockheed Aircraft Corporation to reevaluate the Electra. Both accidents were determined to have been the result of destructive wing flutter initiated by a propeller whirl mode. The whirl mode phenomenon was the result of a loss of structural rigidity following the failure of an engine mount during a hard landing. The propeller whirl-mode frequency coupled with a natural frequency of the wings drove a destructive flutter mode. The two accidents resulted in a substantial design evaluation, and a subsequent redesign of the engine nacelles and mounting structure.